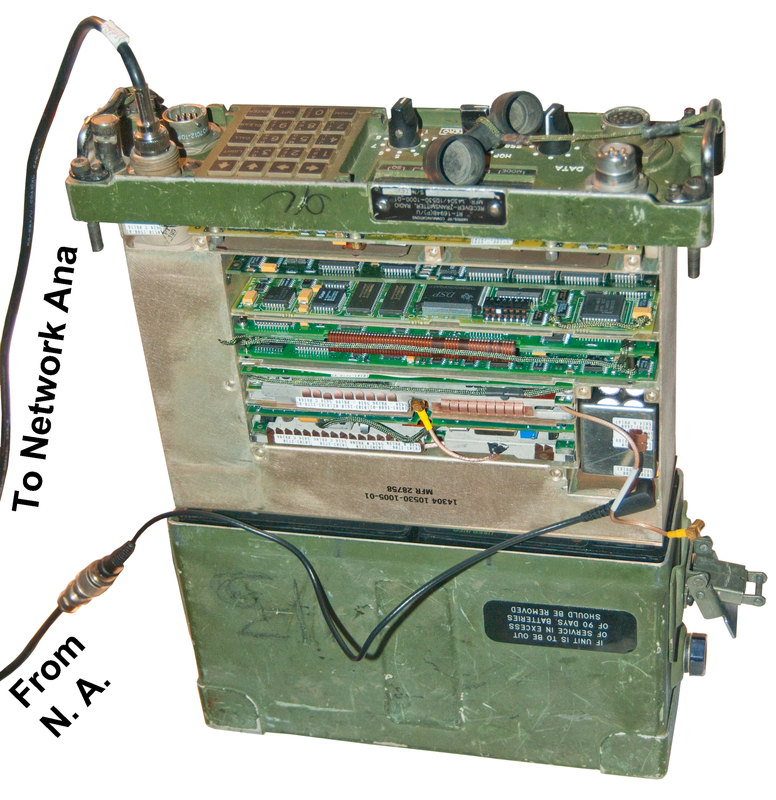 This is a modern Harris H.F. receiver transmitter and will fit into a large priority USPS mail box with room to spare. The manpack version of this radio is the PRC-150 (Wiki). 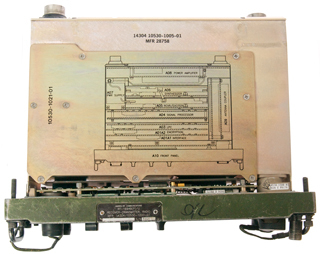 Known as the Multiband Falcon II radio by Harris, aka Falcon 5200. 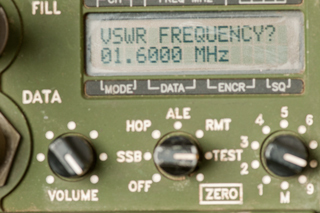 Covers 1.6 to 59.9999 MHz (HF and VHF ranges, but not the full 30 to 88 MHz VHF low military band). Output power levels: 100 mw (drive to external power amp), Low: 1 Watt, Medium: 5W, High 20 Watts. 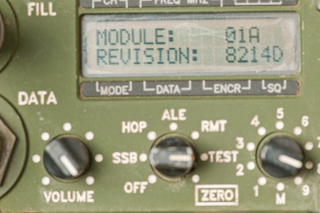 Note: This radio is smaller than the PRC-25 or PRC-77. 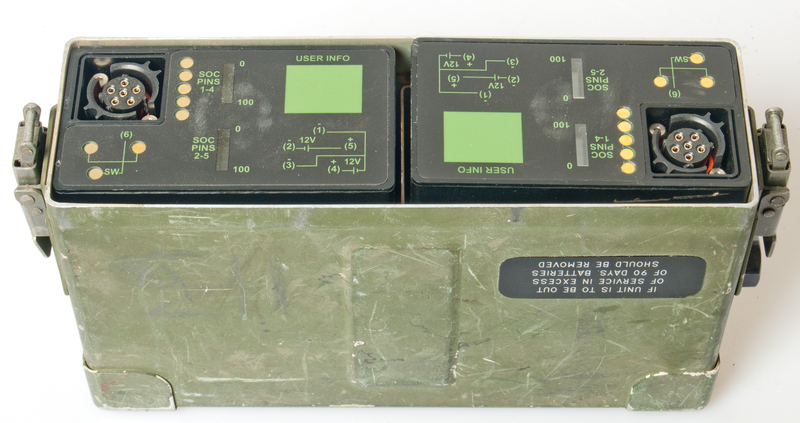 It uses the same dual 5590 type battery box as the RT-1319/PRC-113. 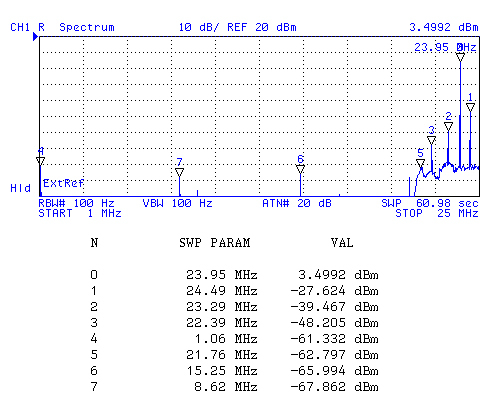 The radio powers up on 1600 kHz and it happens there's an AM broadcast station that's very weak there. Checked on my car radio and it's too weak there to understand, better on the PRC-138. How many of these radios were made? Here's some info on the boards for different versions, but not sure how this correlates to the above table. This radio is a V2. A4= 10530-2500-01 Rev (no change) "E42C" sticker on large chip. This box mounts the radio without a battery box to form a combined radio-amplifier. By installing or removing modules various options can be implemented. 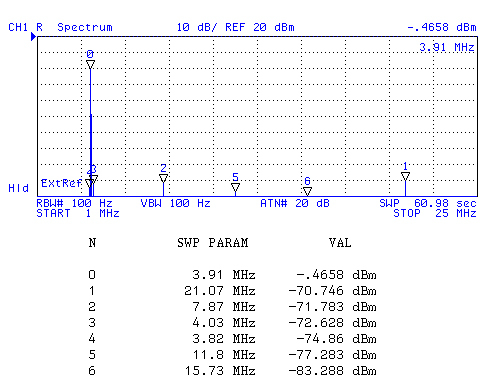 As received it was not possible to change out of SSB mode or change the frequency. Doing that requires the security password (an eight digit number). But after changing to 1k996 USB, 3k996 USB or 7k257 USB I'm getting HIGH VSWR messages. I'm in communication with TCI to see about troubleshooting it. 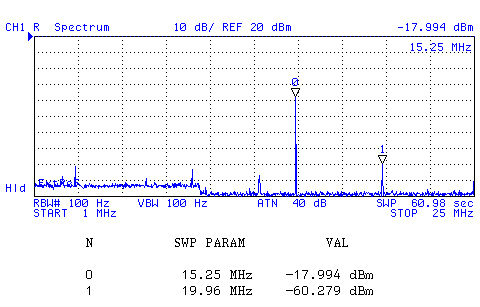 11 March 2013 - the TCI 651 antenna may be fine. After installing a fresh LTC-7PN 3.5 V 750 mAh memory battery the radio tunes very quickly. So the problem tuning may have been caused by lack of the memory battery. In my car I can't hear any station on 1710 kHz, but on the PRC-138 with the TCI651T antenna there's a loud and clear station. 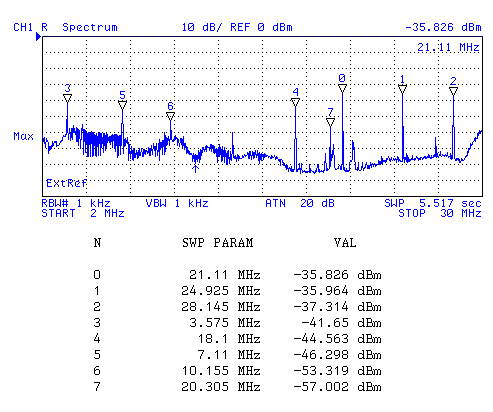 As I learn about the radio I've seen some strange behavior related to tune faults or VSWR measurements. Withe the mode switch TEST and TEST selected a Built In Test Equipment (BITE) test is run and the result appears and the back light is turned off. Pressing LIGHT clears the test result. It's as if they didn't want you to see the result. 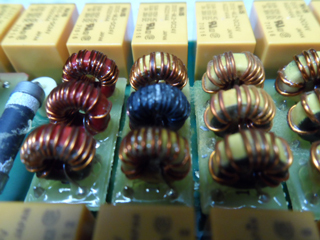 Module A08 is the RF Power Amplifier and Harmonic Filters. 51H = 0101 0001 or 71H = 0111 0001 or bands: 7, 5 & 1 or bands: 7, 6, 5 & 1. Another way to see if this is a problem with my TCI 651T antenna or with the radio is to test the radio with a Bird Power Meter and 50 Ohm Load (Heathkit Cantenna). 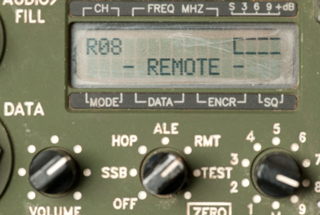 By selecting one of the programmed channels, pressing PTT and making a lot of noise into the mike (with no mike input there is no RF output for SSB modulation, and only a small amount of output for AME. The best way would be to key in CW mode or a data mode where you would get 100% power. But, in any case, there were tune faults using the matched load, so this confirms that there's a problem with the radio. 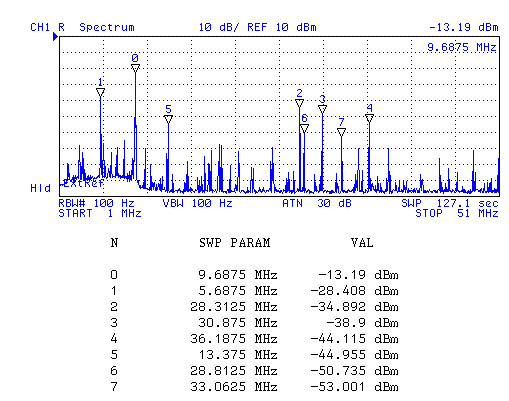 See the ALE section below (and scroll down for the spectrum plot) where there's no sounding signal on 40 meters. 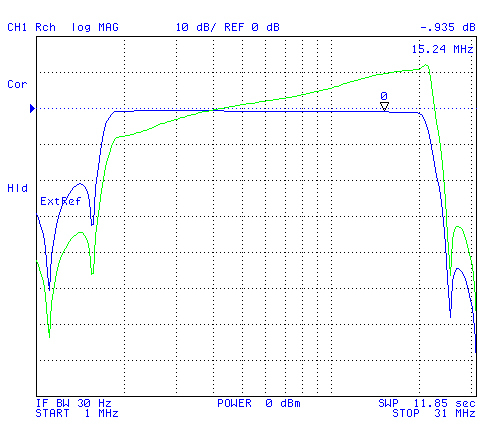 The 50 Ohm load setup shows a tune fault on the 40 meter output. On the left and right are the battery chargers. In the center is the RF power amp. They are SPDT latching with 2 coils (Set * Reset) 6 pins. 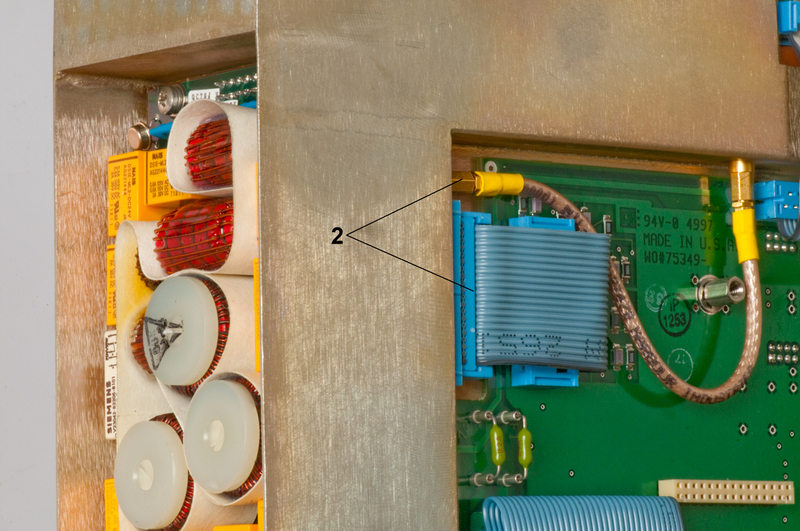 The big resistor in the center of the harmonic filter board should be 50 Ohms. But it measures a dead short. This is normal because it's shorted out by a transformer. By energizing relay K17 the 50 Ohm resistor can be measured and is 46.6 Ohms 7% low is OK for 10% spec). But . . . is that really the problem? 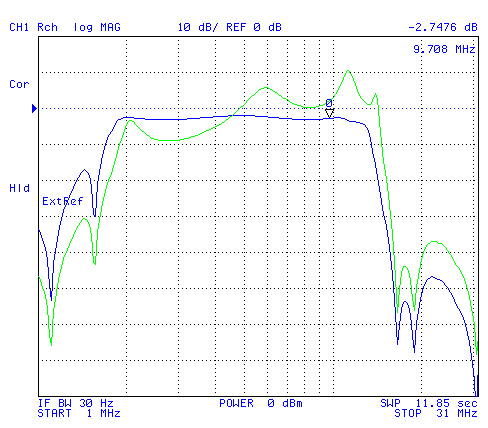 to A8 RF In/Out from/to A5 Exciter. The coax connectors may be SSMB or 1.0/2.3 Snap-on. diameter is too big to fit. so one of the cables that's on order should work. that you can monitor it without using board extenders. 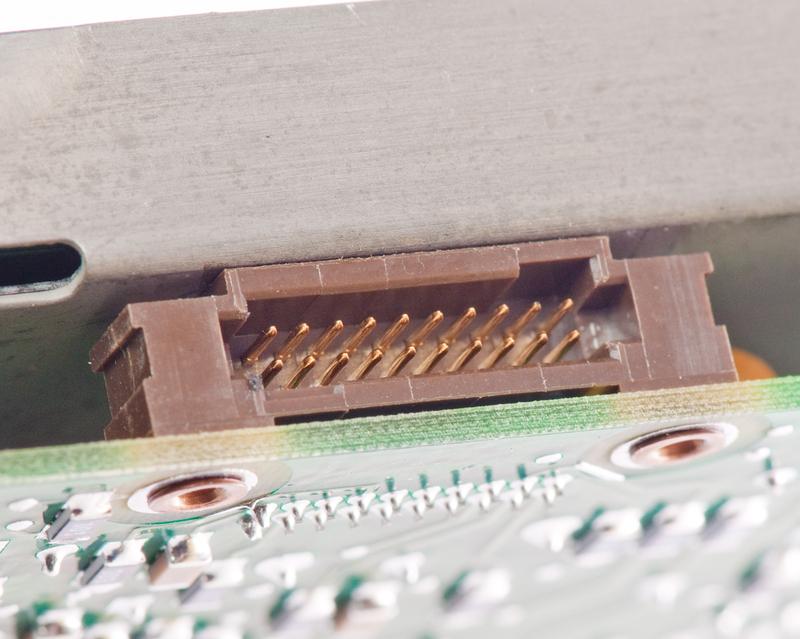 If the connector type was known board extenders could be made. TNC to BNC adapter for scale. 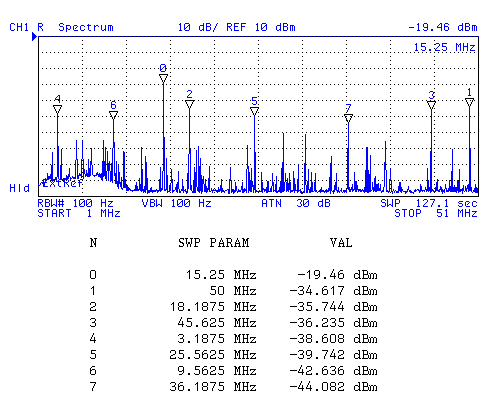 Pass band frequency in MHz. Bold are bands with fault. The most likely problem would be bad relays. 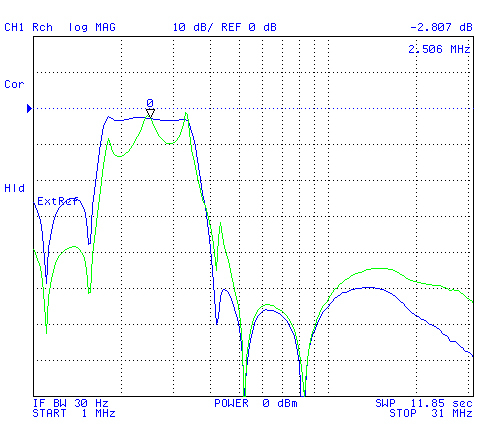 The problem is in the A9 Antenna Coupler. 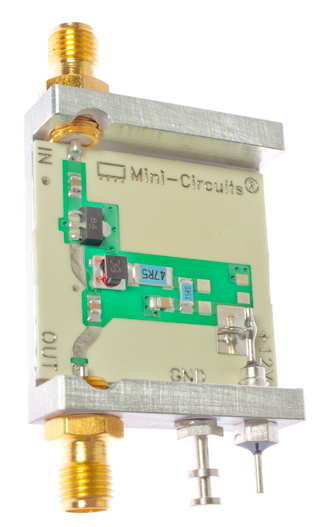 Minicircuits makes an IC RF power amp (GALI-84+) that's very broadband. The TB409-84+ RF Amp Evaluation kit has the IC mounted with the needed components with SMA connectors. 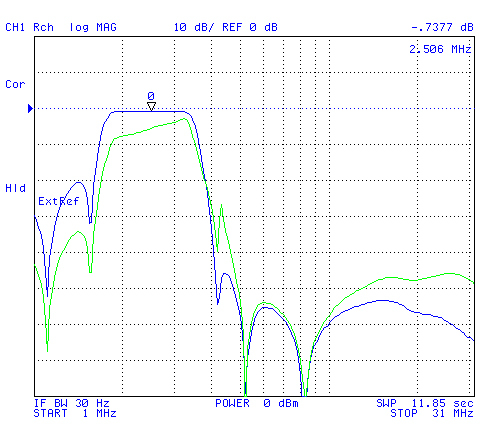 DC to 6 GHz, 25 dB gain, >+20 dBm output. 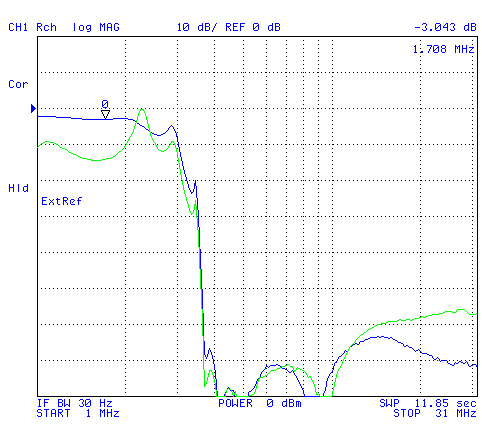 Could be used to replace the A5 amplifier or as the front end of a power amp. 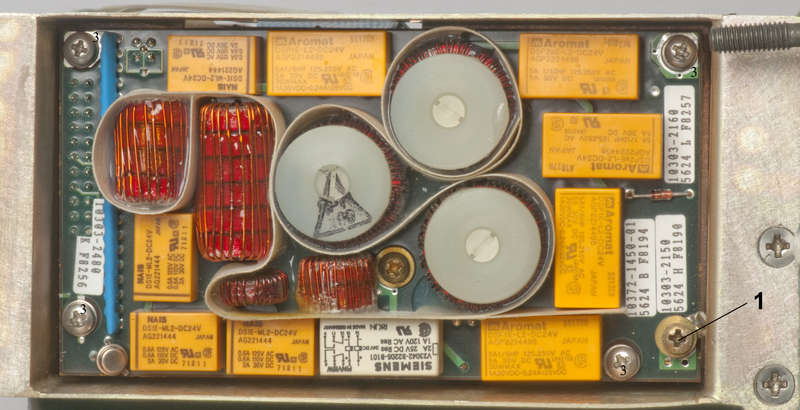 The A8 module was removed and the harmonic filter board separated (re-seated). 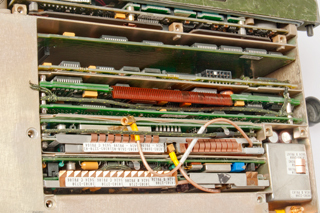 All the other boards were re-seated as well as the ribbon cables. 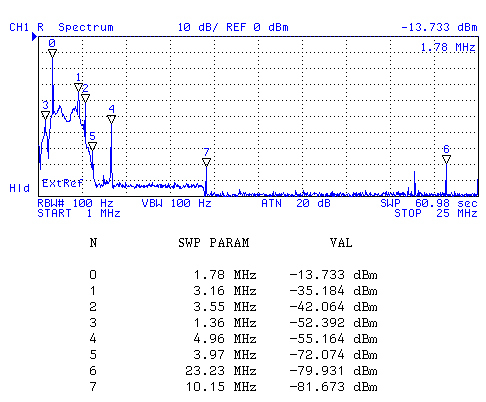 Channels 21 through 27 were programmed at the geometric center of bands 1 to 7 in CW mode. Tests done with output to Bird power meter then Cantenna, see above. switch back to SSB and repeat for each channel. 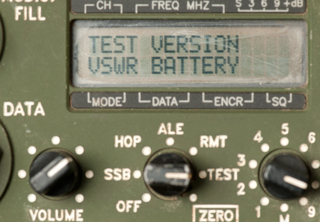 The "Watts" column comes from the VSWR test display. 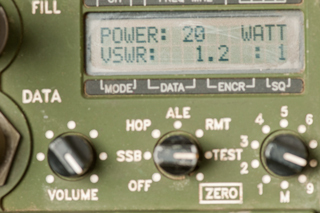 There's a firmware bug in that it displays 20 Watts when the output is full power, even if the radio is running in a lower power mode where the max output power is much lower. The power seems to be decreasing rapidly with frequency. I would expect it to be above 20 W at all frequencies. 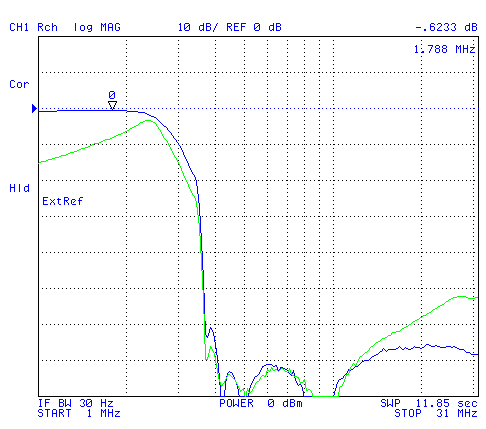 Maybe a bad RF power amplifier? By running the radio in low power and with the harmonic filters disabled (the broadcast band high pass and the 60 MHz low pass enabled) the exciter can be analyzed. 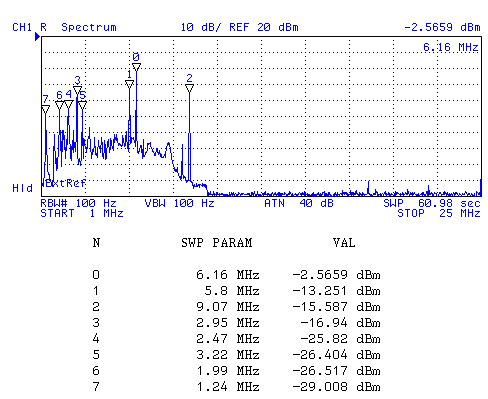 These spectrum plots were made by connecting the radio output directly to the spectrum analyzer 50 Ohm input ( input attenuator set to 30 dB). 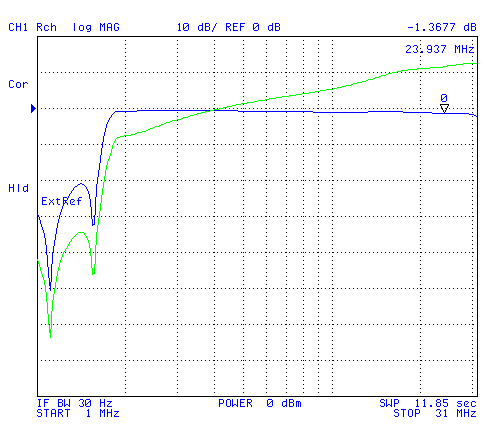 I think the fundamental output should be 50 mW? 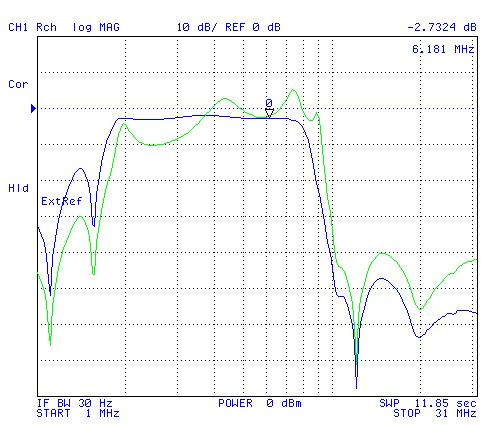 Rx Sensitivity with preamp disabled and IF BW at 350 Hz. 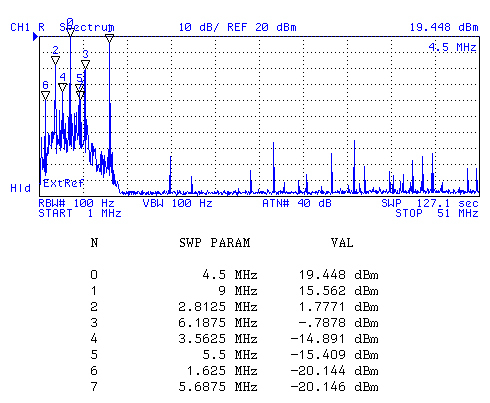 Signal from HP 8648A Sig Gen.
Radio in receive mode, looking at what comes out the antenna BNC connector. There's probably a 25 MHz crystal running. 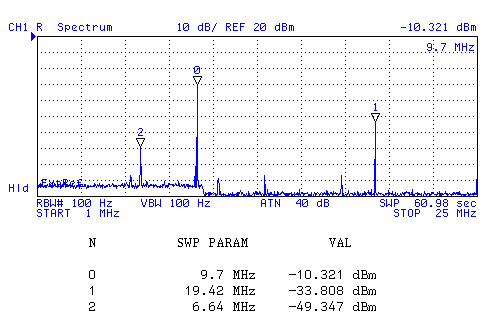 BUT . . there are signals at 4.5 & 9 MHz at +19 & +16 dBm. Note: this was the only frequency heard when ALE sounding. This can be done as either a full S11, S21, S12, S22 test or as just a transmission test. This can be just a power out test or also include a receive sensitivity test. 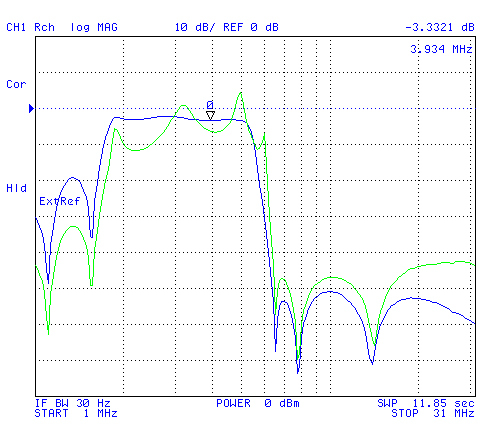 BNC cable from HP 4395A Network Analyzer goes to SSMB adapter cable then to A8 Amplifier-Power Amp. 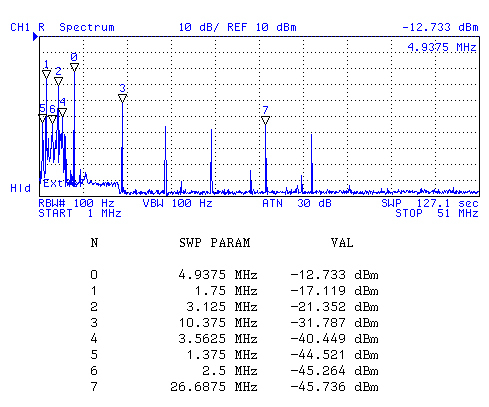 BNC cable from PRC-138 ANT connector goes to "R" receiver on network analyzer. 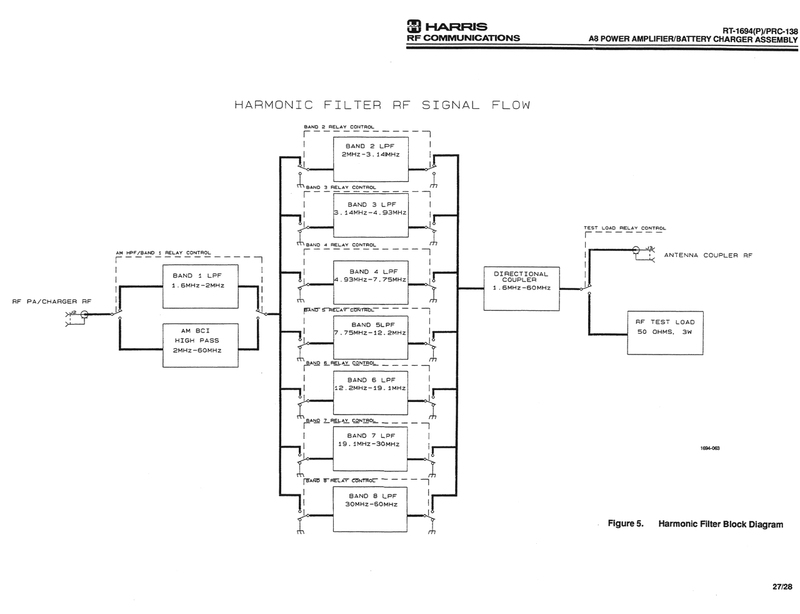 Note: in receive mode the RF Amp is bypassed so you see only the harmonic filters. 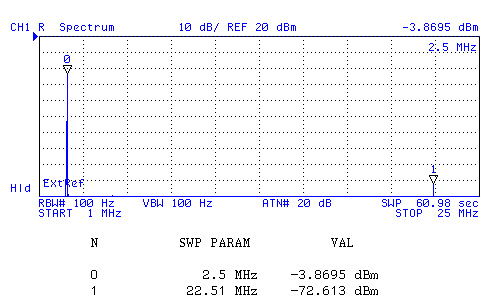 When the radio is keyed the RF amp is switched in (low power mode) and so you see it's gain curve, which is pretty much the same in the filter pass-band. 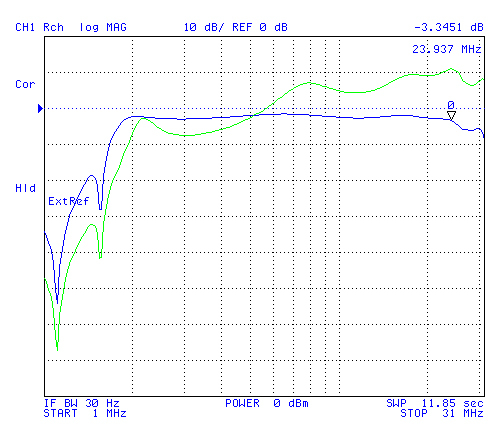 The Tx gain (green) should be in the 10 to 20 dB area, but is near zero. Next to repeat these tests with the coupler disabled. 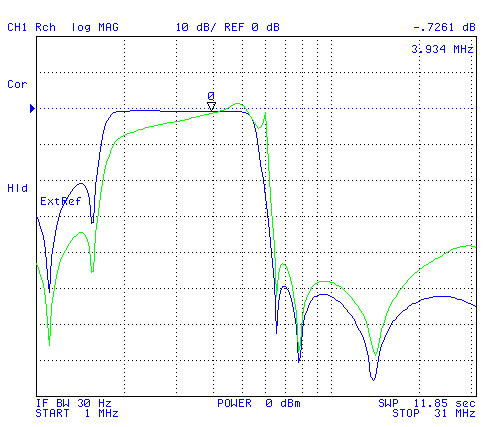 The Rx preamp is bypassed in both the following tests. 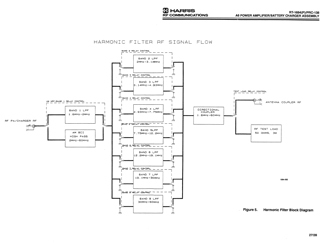 The harmonic filters are working fine. Something in A8 near Q5, Q4A, Q4B. The adjustments on R36, R48 & R55 might show where the problem is. That requires supplying power with current monitoring. A couple of 5590BA battery adapters (two to support the radio), but with a bench power supply instead of batteries. 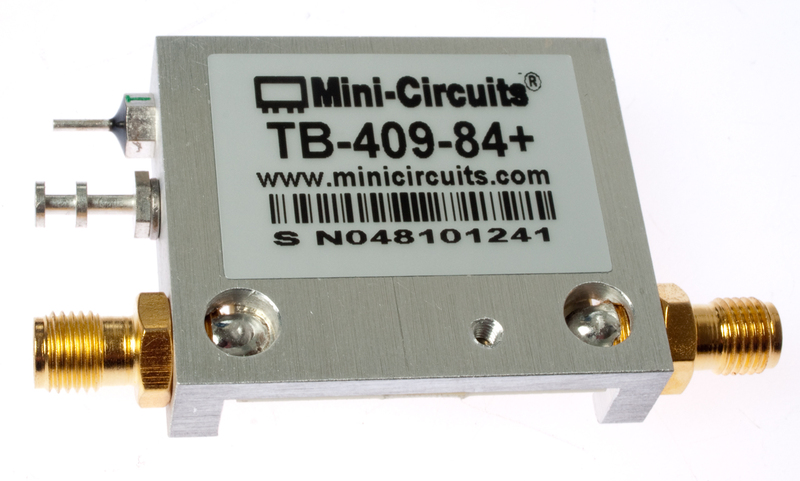 The Q4 & Q5 transistors are not the problem because they are for the 25 Watt power level. 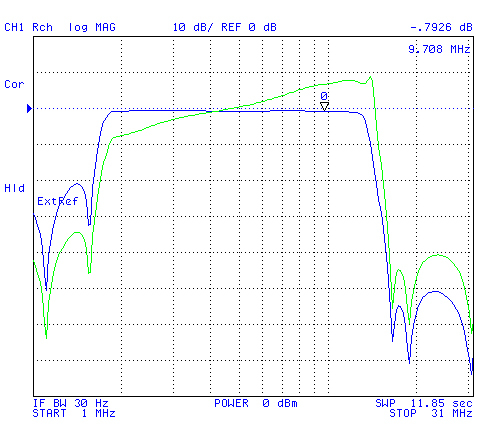 When Low Power is selected the 100 mW (+20 dBm) signal comes directly from the A5 exciter module. The A5 module uses U3, U1 & Q5, U2, T1 to generate the 100 mW signal. When this battery fails the radio will not remember setup information so it will need to be entered every power up. 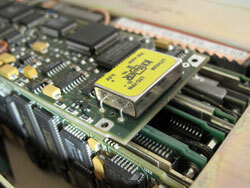 Also see the A01A1 Interface Board below. Note: Do not use a socket. Sockets result in poor electrical connections after some years, so will decrease the reliability. It's been suggested that my antenna may be a poor match and that caused this problem. But I don't buy it because the radio has VSWR sensing and power reduction when it sees a poor match. That's very important for a radio that covers 1.6 to 59.9 MHz where no single antenna is likely to be a good match across all those frequencies. The radio showed Tune Faults when initially trying to use it and after replacing the dead memory battery it started to tune. In the process of replacing the memory battery (the first time the radio had been opened up) a couple of screws that hold the chassis to the front panel were seen to be missing. They were later found on the carpet and replaced. (At no time did I hear them rattling around.). After replacing the memory battery that antenna coupler started working, see Operation above. 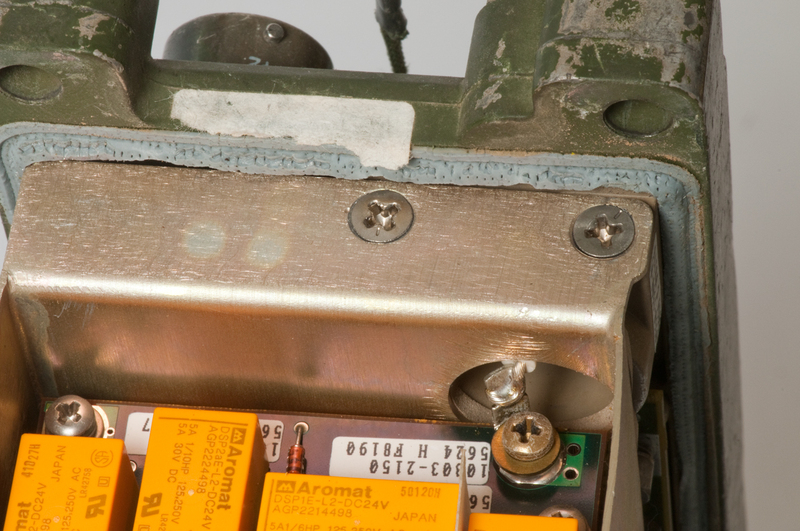 The reason may be that the memory battery is needed for the antenna couple to work and/or it may be that the two loose screws were shorting out some part of the antenna coupler. 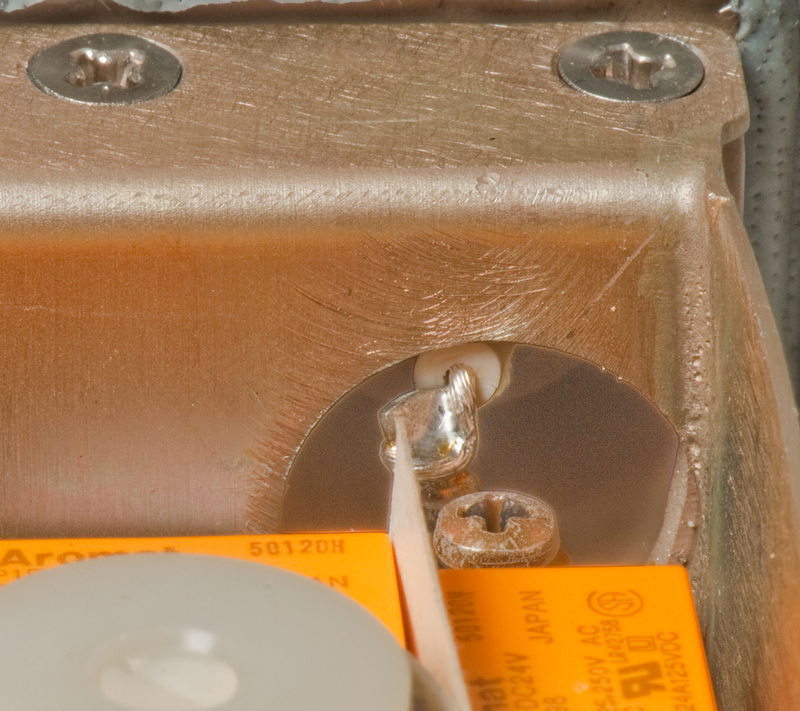 Note the two screws are adjacent to the antenna coupler circuitry. This doesn't help much in troubleshooting, but does shed some light on what went wrong. Seems that the hot antenna wire is very close to ground. but it doesn't show up in photo. 1. 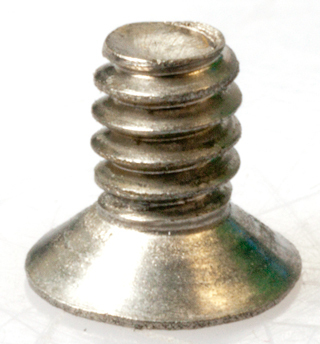 Remove the brass screw holding the antenna connection terminal. 2. 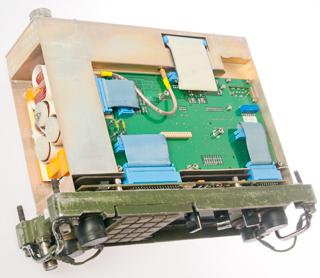 Remove the ribbon cable and SSMB coax connection on the bottom of the chassis. 3. Loosen the 4 captive screws holding the A9 board and remove. The JTAG (Wiki) connector in next to the TMS320C50 DSP chip. 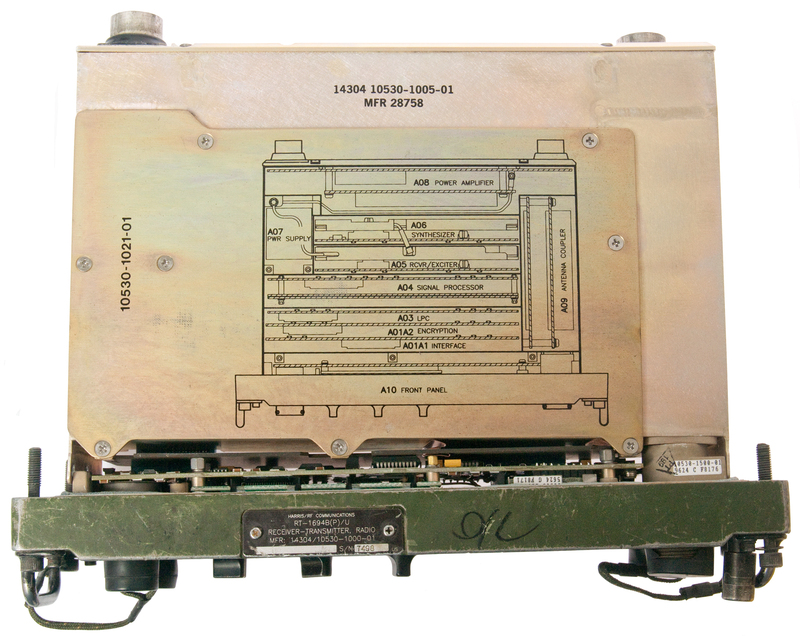 The TMS320C50 DSP chip has it's JTAG terminals wired to only J1, not to any other place in the radio. 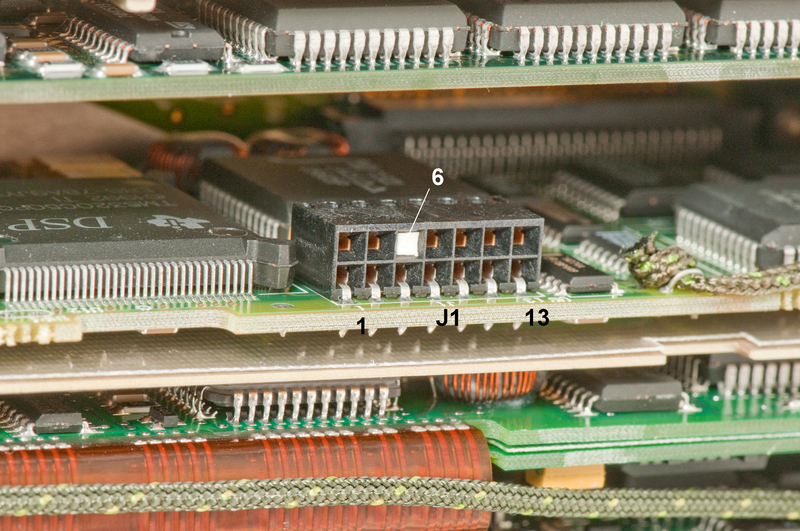 But the TMS320C50 DSP chip is wired to U1 a TN83C51FB which has Port 1 directly on the P1 connector. 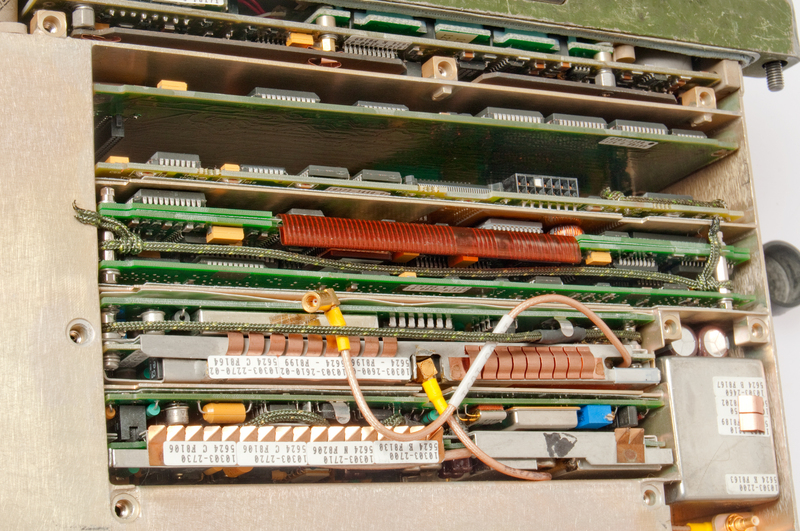 It has 16k EPROM and 256 bytes of RAM. U4 is an IDTIDT71321 Dual Port High Speed 2k RAM with one side connected to the TMS320C50 DSP and the other to the TN83C51FB using the address and data buses of each IC. http://www.gojtag.com/ - 4 April 2013 package on the way. 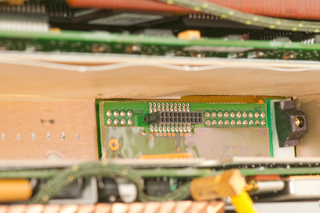 The A5 board has an SSMBf coax cable hard wired that goes to a male-male connector mounted to the chassis. 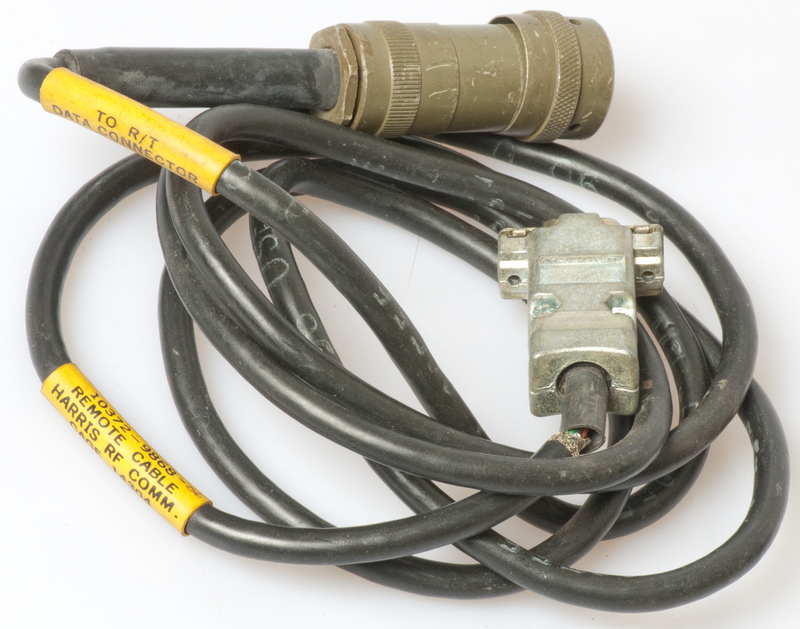 The other side of this connector is a loose female-female cable (10372-1053-61) that goes to the A8 RF Power Amp. 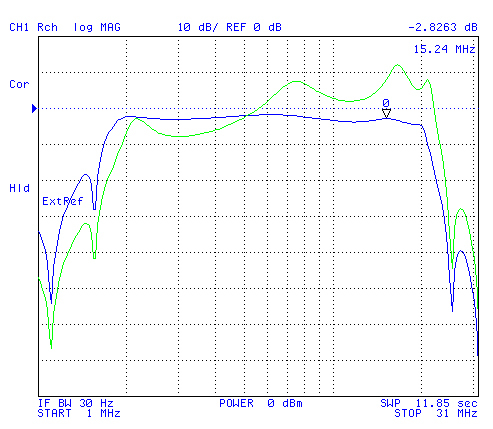 There is another coax cable between the A8 Power Amp and the A9 Antenna coupler. The DATA connector has pins for two different functions. 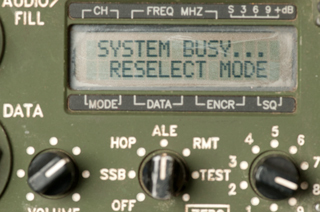 Sending commands to the radio and receiving it's status and/or sending and receiving data using the modem function of the radio. 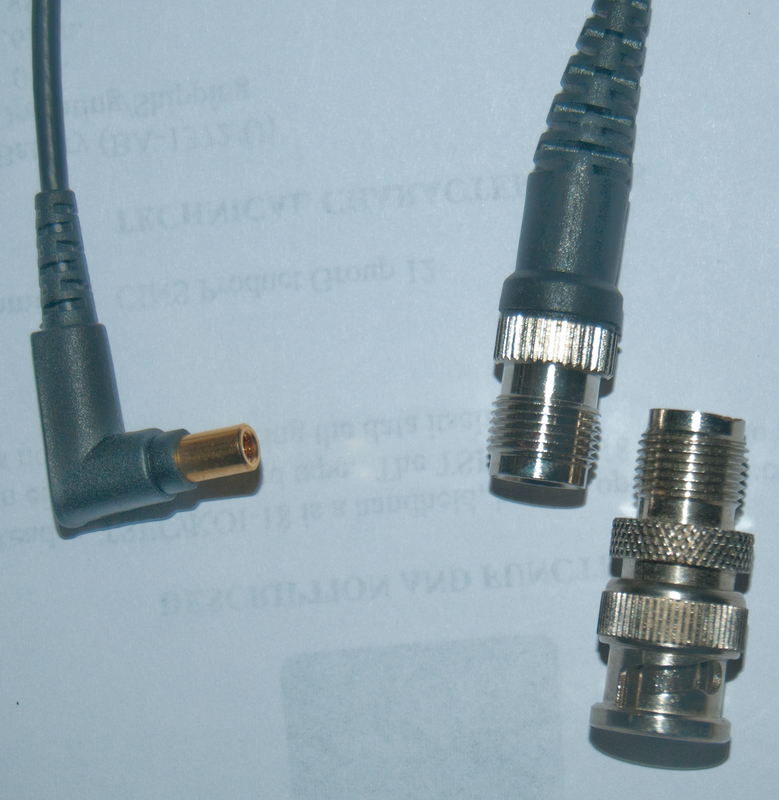 A Y cable could be made to allow both of these functions to be done at the same time. 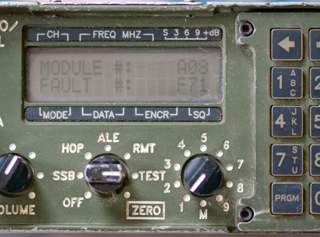 The remote control panel from a 5000 series Harris radio can be connected to the command & control serial port at this connector. Remote control is by means of an ASCII terminal or program sending and receiving ASCII commands, or a Harris 5000 series hardware remote panel. 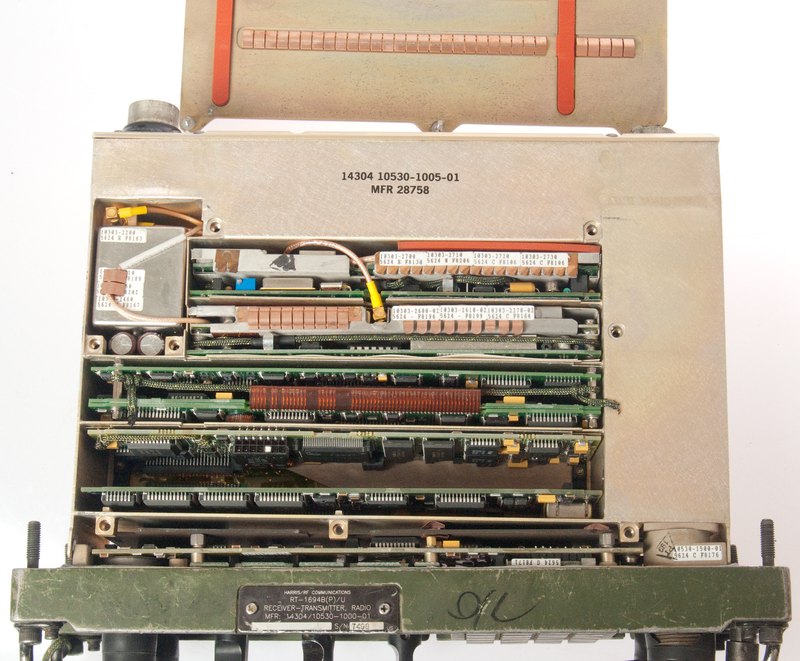 The computer end is a DB-9f and the radio end is a PCI U-316/U 14 male pin 3-lug mil connector. 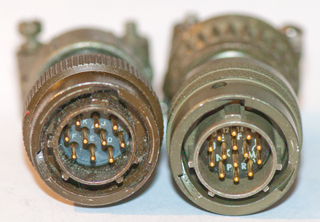 Comparison of two PT06 connectors. 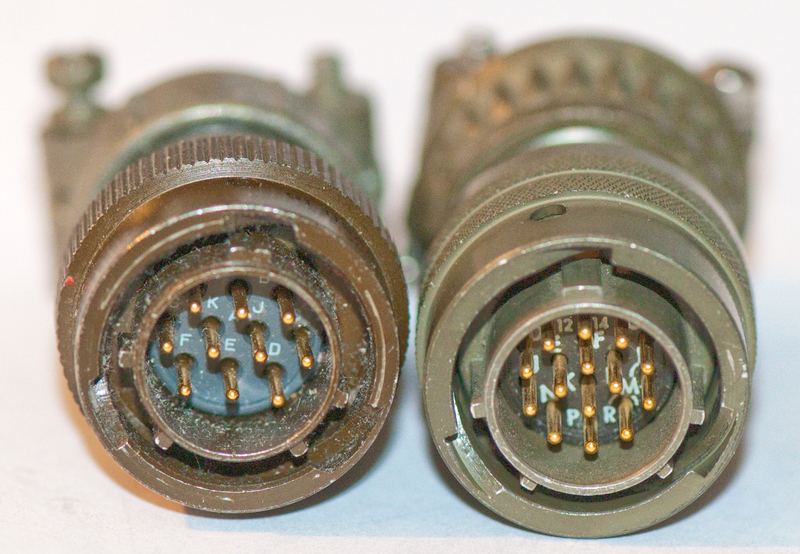 On the left is the 10 pin connector that fits the PRC-25 & PRC-77 POWER connector. 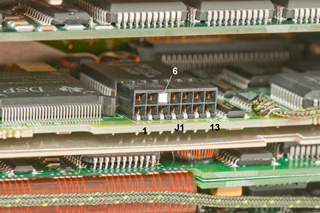 On the right is the 14 pin DATA connector for the PRC-138. Because of the way the cable is made (nothing connected to DB-9 pins 1, 4, 6, 7, 8 or 9) there is no hardware flow control. 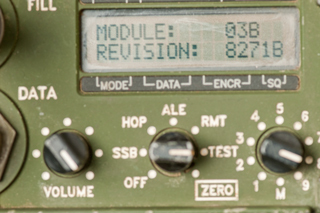 But the radio uses RTS/CTS (pins P & L on the U-316 but there's no jumper between them, so there's a problem depending on how the radio asynchronous port is configured. Checking the radio SSB \ Config \ Ports \ Remote: changed from 2400 to 9600 baud, but left others at default: 8N1 Xoff/Xon flow control, Echo: On. There is no option for RTS/CTS, so is this cable supposed to work with the RT-1694/PRC-138? ans. the RTS/CTS is used when talking to the data modem in the radio, not sending commands to the radio. The Falcon software requires direct access to the serial port and so will not work in WIN XP. There are a couple of ways of getting into DOS. In both these cases you need a real serial COM port. The use of a USB to Serial adapter is problematical. For newer computers you can install a bootable version of DOS on a USB thumb drive along with the Falcon software files and boot from that. For older computers you can install a bootable version of DOS on a floppy or CD-ROM along with the Falcon software files and boot from that. Probably not really power off, but rather very low current standby. 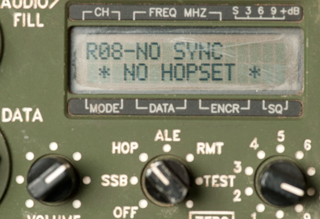 This is really not Single Side Band mode, but rather single channel mode - defaults to USB. Modern car radios go up to 1710 kHz so there are a number of channels that this radio might talk to? WARNING: Trying to transmit below 2 MHz using the man portable whip will damage the radio. 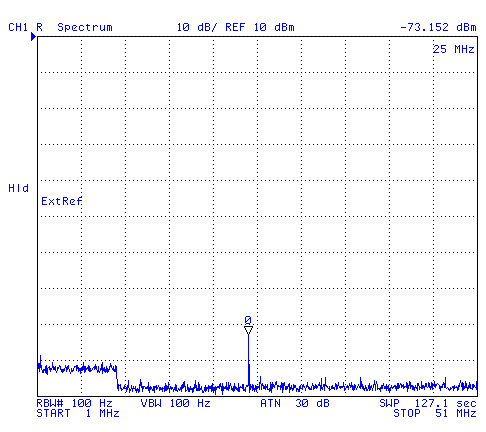 11 March 2013 - my TCI 651T antenna works for receive, but not transmit but maybe I can listen to ALE sounding? The TCI 530 is a log type antenna pointing up, would be excellent for ALE since I live in a canyon in the mountains (about 1,000 ft elevation). Wish list of antennas: TCI 530 (takes a 300' square) or 545 antenna (takes an 85' square) please let me know. 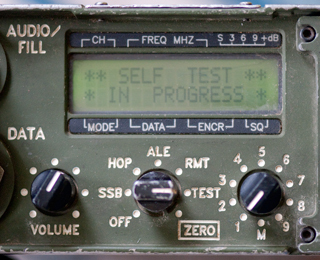 12 March 2013 - the radio is sounding on the HFN net. More tomorrow after it's collected some data. after a day running ALE sounding in the lower right was "M1" meaning one message. 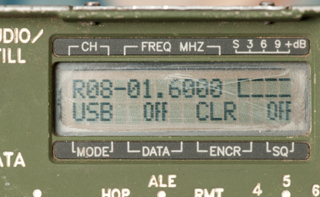 Remote Control (can use RF-5000 remote). It's based on a serial data connection like RS-232 or MIL-188 using Xon/Xoff. There's a floppy disk with FALCOM.EXE and other files. Let me know if you have a copy. Use the arrow keys at the top of the keyboard and the ENTER key to navigate the menus. Note: An H-250 handset and the TCI TCI-651T antenna are connected for these photos. This is the mode to erase all the programming. It feels like there's a stop preventing the switch from going to the ZERO position. 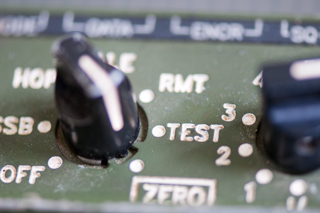 The knob must be pulled out to clear the stop that prevents accidental zeroing. The "NO" is flashing. Pressing the up or down arrow changes it to YES. Pressing ENTER zeros the radio. These keys are used to move between menu items. NOTE: in some menus there are more items that can be displayed so the last item is ->. You MUST scroll right (->) in order to see those off screen items. In a similar manner you need to use the right arrow key to see all of a message that's too long to fit on the screen. When a menu item is blinking if you press ENTER you will set the item to the current value. When a menu item is blinking if you press Up or Down the item will change values. NOTE: This is not intuitive so do try up and down on blinking items to see what happens. Call only works when the mode switch is at ALE. The function of the CLEAR button does not depend on the mode switch, but does depend of context. When in any of the menus pressing CLEAR is like pressing RETURN, it takes you up one level in the menus or if in the top menu takes you out of program mode. When entering data CLEAR works as a destructive backspace. For example to enter a message containing CA (for California) the A and C letters are both on the 1 key so after getting C displayed you need to press some other key to "set" the C, say you press 9. Now pressing CLEAR erases the 9 and you can press 1 the press 1 again to get A. This is a classical ENTER key used to accept the current variable. The function of the option key depends on the mode switch position. The top level choices are shown below. The function of the program key depends on the mode switch position. under CFIG you can set the TIME. To change the date a remote terminal is needed. 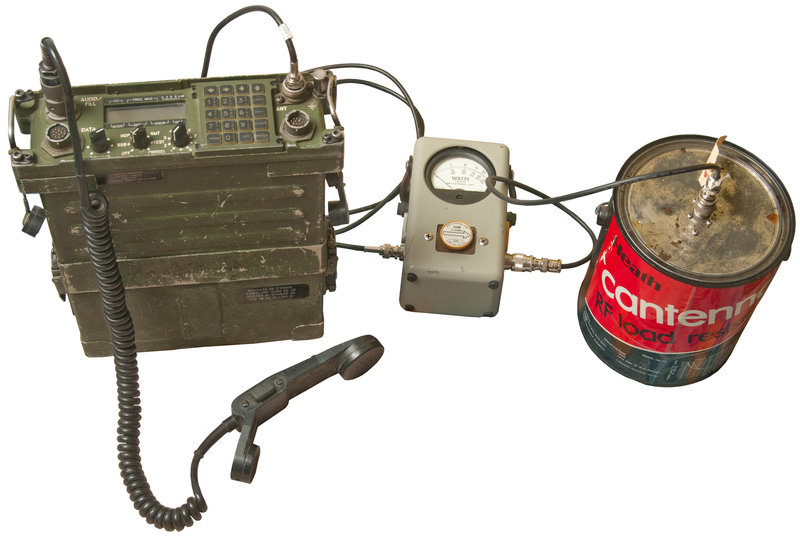 Can program the radio or the RF-5961 loader. Needs to be filled with the RF-5960. I'm using a couple of BB-2590 batteries and charging them with the PP-8498/U. 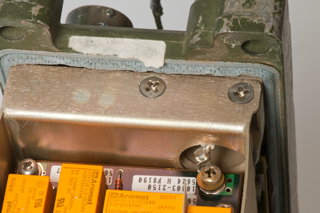 The RT-1694 has a jumper between battery terminals 2 and 4 so is using each battery as a "24 Volt". But there are no hard jumpers between the two batteries. The radio can be operated with a single battery but that will result in reduced output power and shorter talk time. 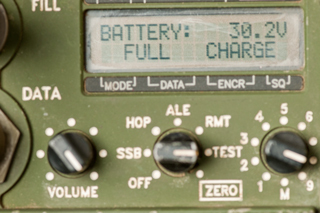 The radio can use any of the BA-5590 family of batteries. 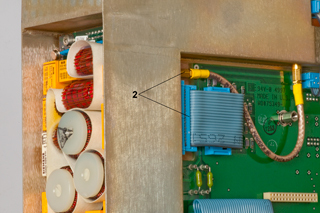 The two fuses are marked 7A. 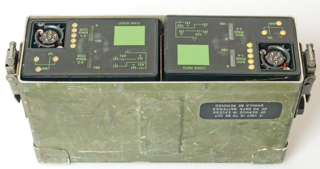 a couple of BB-2590 batteries. When channels are programmed they do not survive power off so the memory battery probably needs to be replaced. Upper left SSMBf coax from A5 in this photo to A8 hidden. or connect to other side of SSMBm-SSMBm panel mount jack. From the FCC data base. KGST       AM 1600 kHz DAN  Daytime         B B LIC  FRESNO                   CA US      BL-19810507AC       5.0   kW   38453      LOTUS FRESNO CORP.
KGST       AM 1600 kHz DAN  Nighttime       B B LIC  FRESNO                   CA US      BL-19810507AC       5.0   kW   38453      LOTUS FRESNO CORP.
NEW        AM 1600 kHz ND2  Daytime         B B APP  LEMON GROVE              CA US     BNP-20040129ARH      0.25  kW   160822     CHRISTYAHNA BROADCASTING, INC.
NEW        AM 1600 kHz ND2  Nighttime       B B APP  LEMON GROVE              CA US     BNP-20040129ARH      0.25  kW   160822     CHRISTYAHNA BROADCASTING, INC.
page created 7 March 2013.